- restores natural lip colour. Apply the Yellow Peel Balm sparingly to the upper & lower lip using the tip of a clean finger. Be sure NOT to apply to the moist corners of the mouth. This may be followd with a lipstick containing Sun Protection Factor. Re-apply the balm every hour up to 6 times per day. It is not necessary to wash the lips for re-application although lip-stick should be removed. 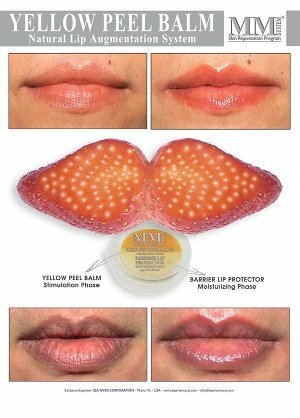 Continue until the lips obtain the desired voloume & a young healthy appearance. At night always use the BARRIER LIP PROTECTOR. After completeing Phase 1, (Above) use the BARRIER LIP PROTECTOR cream several times a day for the next 2-3 days and ALWAYS at night.